During a time, in Greece, which is marked with catastrophe, losses and deaths due to the wildfires of Attica, in many regions of the country the harvest has already begun. So has it, in Santorini. In order to highlight what is happening on the island and what can be expected from the 2018 harvest, I posed a set of questions to winemaker Lefteris Anagnostou of Artemis Karamolegos winery, winemaker and producer Yiannis Paraskevopoulos of Gaia wines, producer Yiannis Valampous of Vassaltis Vineyards and Ioanna Vamvakouri of newcomer Ktima Mikra Thira. Just a personal note on the price issue. Santorini seems to be in a rather precarious situation due to the increase in prices every year. I am afraid, that if these increases continue, at this pace, in the following years, the international markets will be discouraged from further investing in the wines. So, I would advise some prudence, as Santorini affects the image of all Greek wine. YK: What is your general description of the harvest 2018? 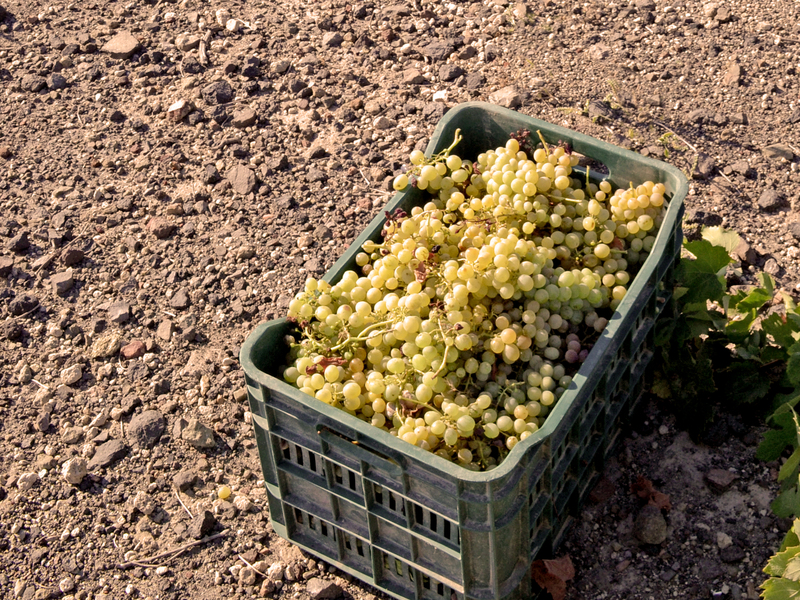 Lefteris Anagnostou: This is a very challenging harvest because of the minimal rainfall, app. 90 mm for the whole season. It has been dry since February. It is also very early ripening, the earliest I remember so far…We started on July 22, versus July 26 in 2016, and August 2 in 2017. This is earlier than ever. Yiannis Paraskevopoulos: It is the earliest ripening vintage, by far. This year, we started harvesting Assyrtiko on the 27th July, while last year it was the 10th of August, so it is more than 10 days in advance. Yiannis Valambous: 2018 is certainly an early ripening vintage, which is approximately 10 days early, compared to 2017. We started with Athiri and Assyrtiko for the Pet Nat on July 22, in the Karterados and Oia region. Ιοanna Vamvakouri: I would say it is definitely earlier, 10 to 12 days. We are starting harvesting the Assyrtiko on Sunday in Thirasia and then on Tuesday in Santorini in regions such as Kamari. YK: Quantity wise what is your prediction? Lefteris Anagnostou: On the low - lying vineyards it is 15% higher when compared to 2017, and, more or less, the same in the higher altitude vineyards, such as that of Pyrgos. Yiannis Valambous: While at the beginning I thought there was possibly an increase of about 15-20% compared to last year, as we continue harvesting the vineyards, I think it is more or less the same. Ioanna Vamvakouri: We cannot be certain at this point. Ιt is too early but I would say up it is more or less the same as last year. There are more grapes in areas like Vourvoulos yet in others like Pirgos or Megalochori it looks pretty much the same or even less. YK: Quality wise what is your prediction? Lefteris Anagnostou: The berries are very small due to the heat and some wind stress, but the quality is expected to be outstanding. Yiannis Paraskevopoulos: Very small berries, due to the lack of moisture, that will yield very concentrated juice but loaded with phenolics. It will need caution. Yiannis Valabous: In terms of quality, I would say that Assyrtiko doesn’t present much fluctuation in Santorini. This is a very good vintage, over all. Ιoanna Vamvakouri: The grapes may be smaller because of the drought conditions yet are of very high quality loaded with aromatics. We can see that already as we taste them. YK: And in terms of prices what do you predict? Lefteris Anagnostou: As expected, there is high demand and this creates pressure for the grapes. This will probably be passed on to the prices of the wine. Yiannis Paraskevopoulos: We were already close to 3.50 euros per kilo last year, which makes costs barely sustainable. Any increase of price will make it restrictive. Yiannis Valambous: There is a lot of competition and this creates the context for an increase in prices. This year, I predict an increase of up to 20%, from 3.30 euros per kilo last year. This will, most likely, be passed on to the prices of the wine. Ioanna Vamvakouri: The rally continues in Santorini with an increase in grapes' price of 15 to 20%. My wish for all the growers and producers for 2018 harvest is to craft top notch Greek wines elevating quality to even higher standards.